There are a number of strategies that you can use to encourage your students to complete their course evaluations. Please be mindful that some students may wish to wait until the end of the evaluation period to complete their course evaluations. 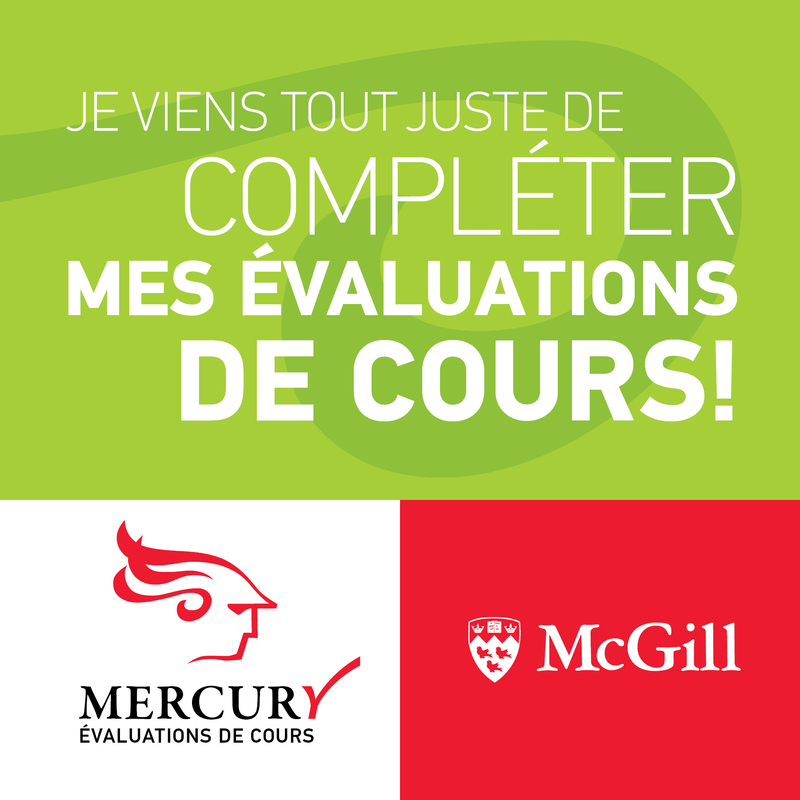 If you have used any other strategies that you would like us to share with the community, please mercury.info [at] mcgill.ca (contact us). One of the biggest incentives for students to complete course evaluations is evidence of their importance to you as an instructor. You should communicate the value of course evaluations both in class, in course outlines, and through your reminders to students. 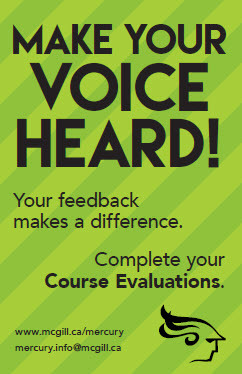 Highlight changes made to the course based on previous course evaluations results. 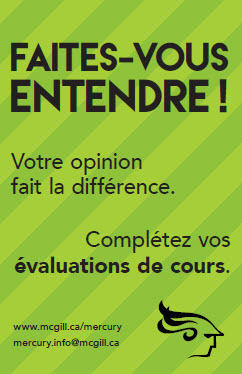 This lets students know that their feedback is taken seriously to improve courses and teaching. In class, present the guidelines on providing constructive feedback to your students. This page contains considerations for students when writing comments, including ways to express valid criticisms in a productive and respectful manner. Not only does presenting this page help you set a positive tone, but it also reiterates your commitment to receiving and acting on student feedback. In class, show this 2-minute promotional video on why students should complete their course evaluations. In class, show this 3-minute instructional video on how to provide constructive feedback in course evaluations. If you have used the form to submit additional questions, let students know that you are interested in receiving their feedback on the questions you have added. 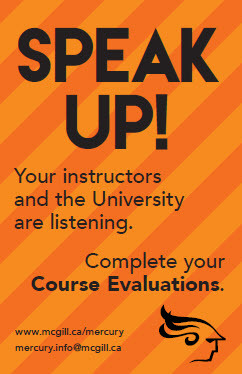 Let students know if you have granted permission to disseminate your numerical course evaluation results (instructions). Students are more likely to complete the evaluations if they know that they and future students will have access to the results at a later date, provided that enough students respond. Mid-course evaluations: When instructors gather and respond to formative feedback received during the semester, students are more likely to recognize the value of course evaluations. View suggestions. Add a slide to your PowerPoint slideshows during the evaluation period to remind students about course evaluations being open. Sample slides are available. Give an incentive to the entire class, such as an additional review session, if the class response rate exceeds an established target. To respect student anonymity, you should not provide incentives to individual students. 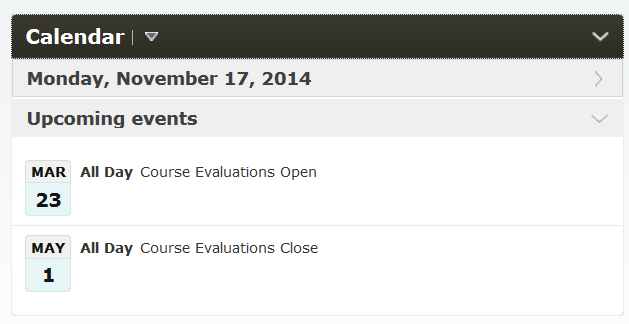 Include the evaluation period dates in your course syllabus and in the calendar in myCourses. Adding the course evaluation period dates (open and closing) to your myCourses Calendar provides another reminder to students about completing their evaluations. On your course homepage, click on the drop-down menu next to Calendar and click the Go to Calendar button. Enter the Event Title, Description, and include the time details in the When section. In the Description you may wish to include the direct link for students to complete their evaluations. Learn more about the Calendar tool. Monitor response rates and post regular news announcements with the current response rate on myCourses. If you have granted permission to disseminate your results, let students know how many responses are needed for the numerical results to be made available to students. If you have multiple sections of a course, encourage friendly competition among the sections for the highest response rate! The News Tool appears on the Course Homepage and allows you to post announcements to your students. Some announcement ideas include a statement on why you value course evaluation feedback, weekly updates on response rates, and links to resources for students, such as guidelines on providing effective feedback. On your course homepage, click on the drop-down menu next to News and click the New News Item button. Enter a Headline and type your message in the Content section. Click Publish when you are ready to post your announcement. Click here to learn more about the News Tool. 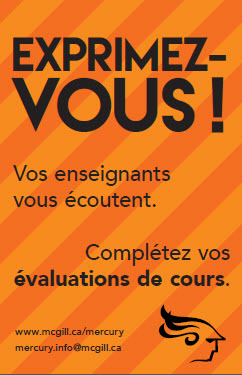 Add the Course Evaluations widget to your myCourses page. It includes important facts about course evaluations and provides a direct link to complete them. 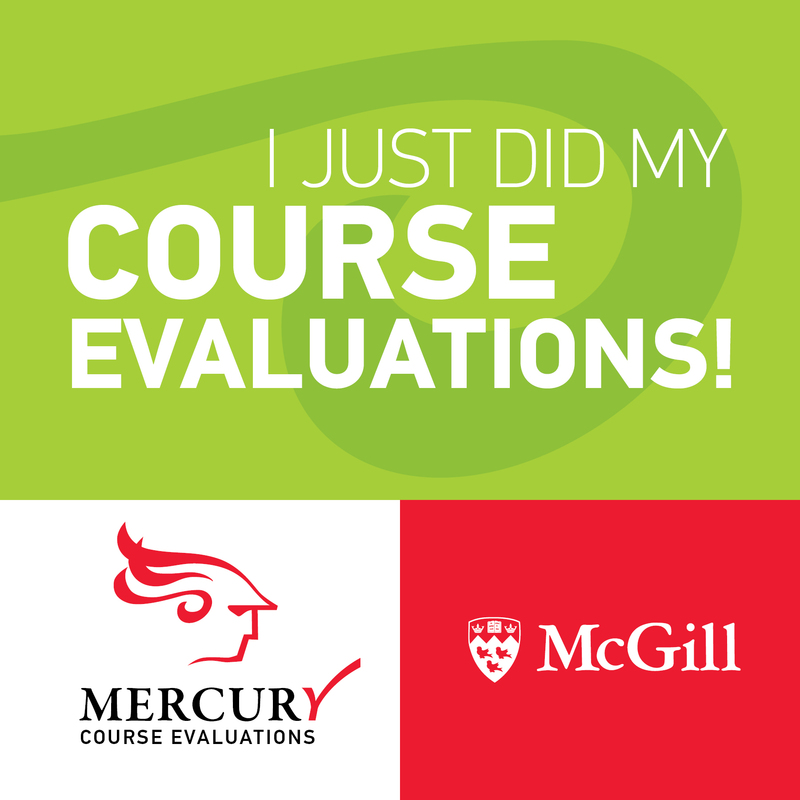 In the Active Homepage drop-down menu, select McGill Course Home + Course Evaluations. Your current Homepage will appear as Active. Click on the link for your active Homepage. 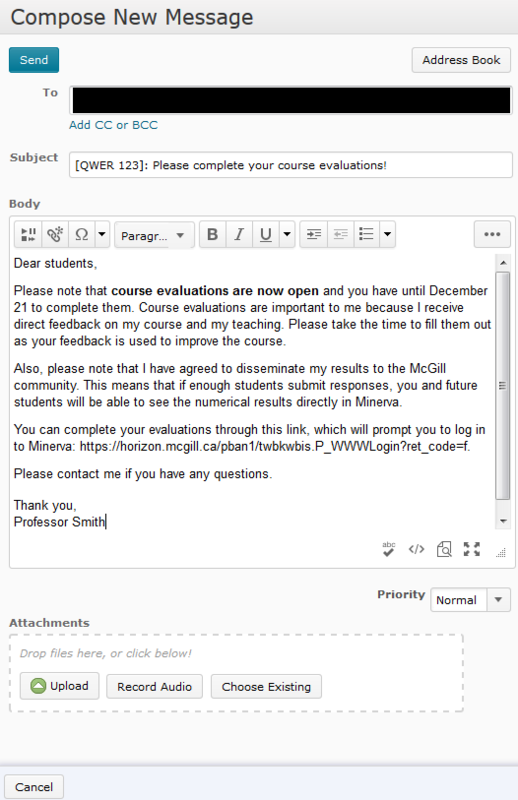 Click on Add Widgets and select the checkbox next to Course Evaluations. Click Add at the bottom of the window. 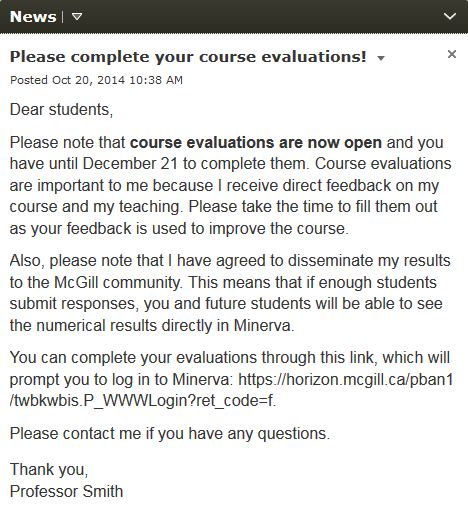 You can move the position of "Course Evaluations" within your Homepage depending on your preference. Press Save and Close and it will be added to the Homepage. Send email reminders to your students. Students automatically receive email reminders from the University about completing their course evaluations, but a message from you that communicates the value of course evaluations may be an added incentive for students to complete them. myCourses has a feature that allows you to email the entire class at once. Click on Classlist in your Navigation bar. Click on the Email Classlist button. Ensure that the All or Students tab is selected. Scroll down to the bottom of the page and click Send Email. Compose your email in the Body and click Send at the top of the page. Learn more about emailing the Classlist. Ask students to bring their laptops, smartphones, or tablets to class and allow time to complete the evaluations during class. It is most effective to do this at the beginning of the class, or during conferences, tutorials, or labs. You and your Teaching Assistants should leave the room during this process. If you have access to computer labs, you can reserve a time during the evaluation period for students to go and fill them out. You and your Teaching Assistants should leave the room during this process. 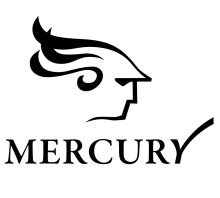 Put a Mercury poster (see below) on your office door. To request a poster, please email mercury.info [at] mcgill.ca and indicate which poster you would like.